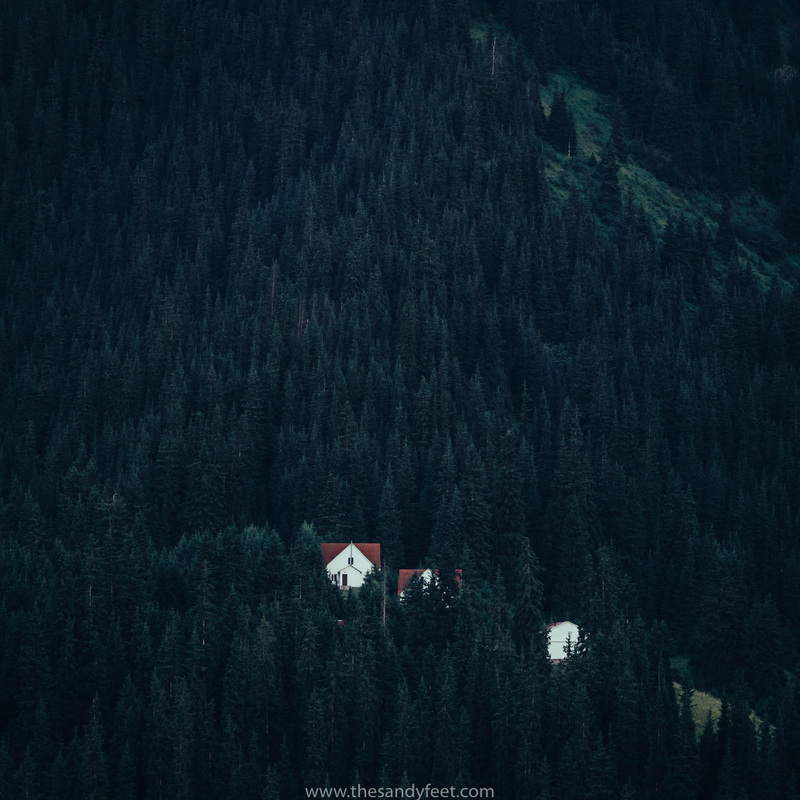 A thread of sapphire lakes, mountain forests dappled in sunlight, fields sprinkled with wild strawberries and dancing flowers and the sweet scent of vanilla permeating the air. Those who make the arduous journey to the Kolsai Lakes are certainly rewarded. 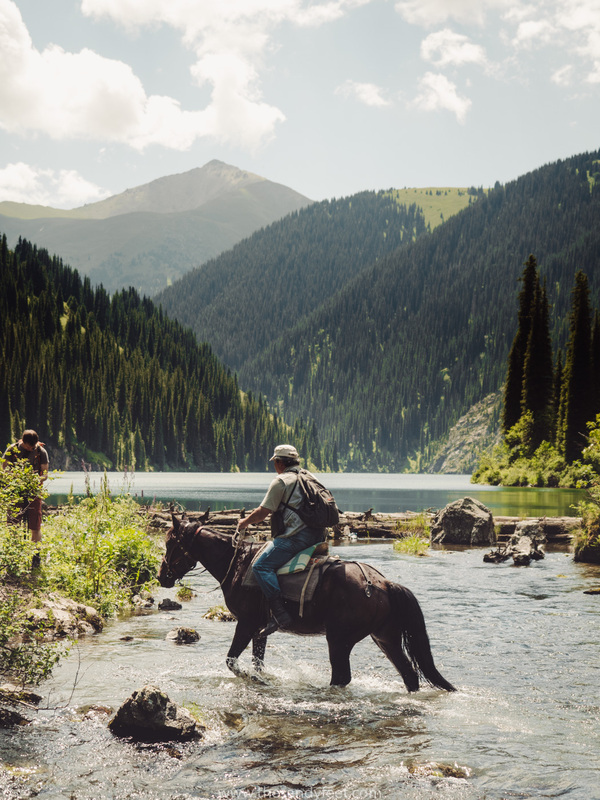 For nature lovers, the lakes are a wonderful place to disconnect, fill your lungs with mountain air, muddy your hiking boots and experience a simpler life in the Kazakh countryside. Those just looking to relax could not choose a prettier place to kick back. 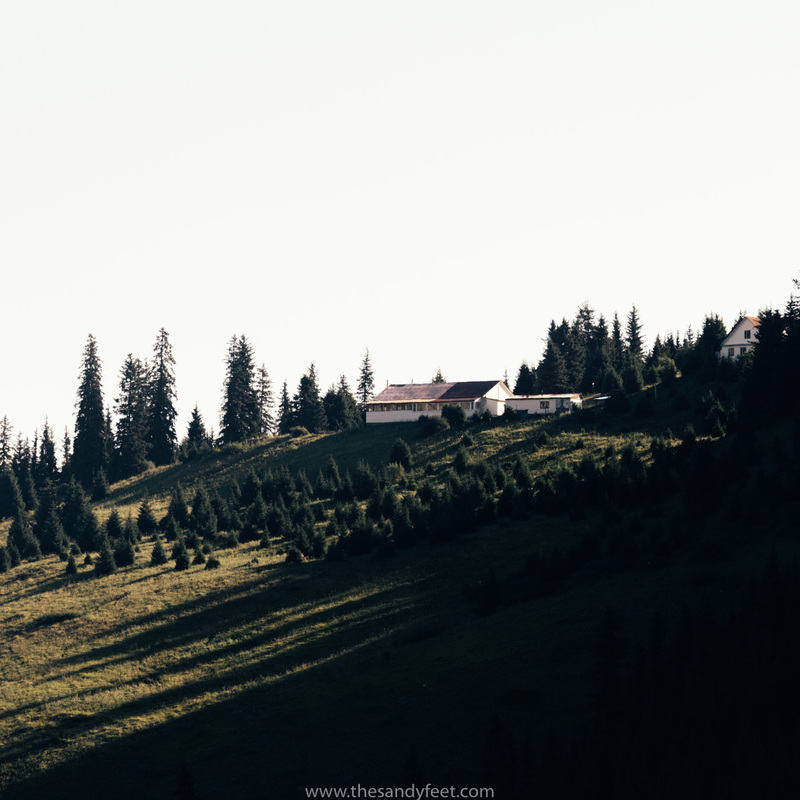 Though this gorgeous corner of the country is becoming more well-known to foreign tourists and is one of the most popular places to visit from Almaty, local visitors far outweigh their international counterparts. The difficulty many travellers face in reaching the Kolsai Lakes and Lake Kaindy mean many opt for an organised tour, but with a little patience, and a few extra days up your sleeve, reaching the area independently is entirely possible. If you’re planning a trip to the Kolsai Lakes and Lake Kaindy, here’s everything you need to know to plan your trip. Hike To The Second Lake. 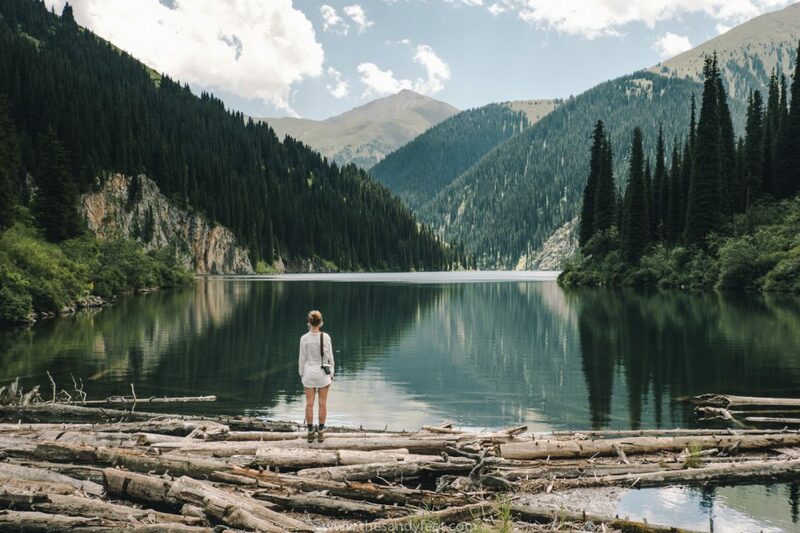 The beautiful hiking trail that runs between lakes one and two is, most likely, the whole reason you’ve ventured to this far corner of Kazakhstan. 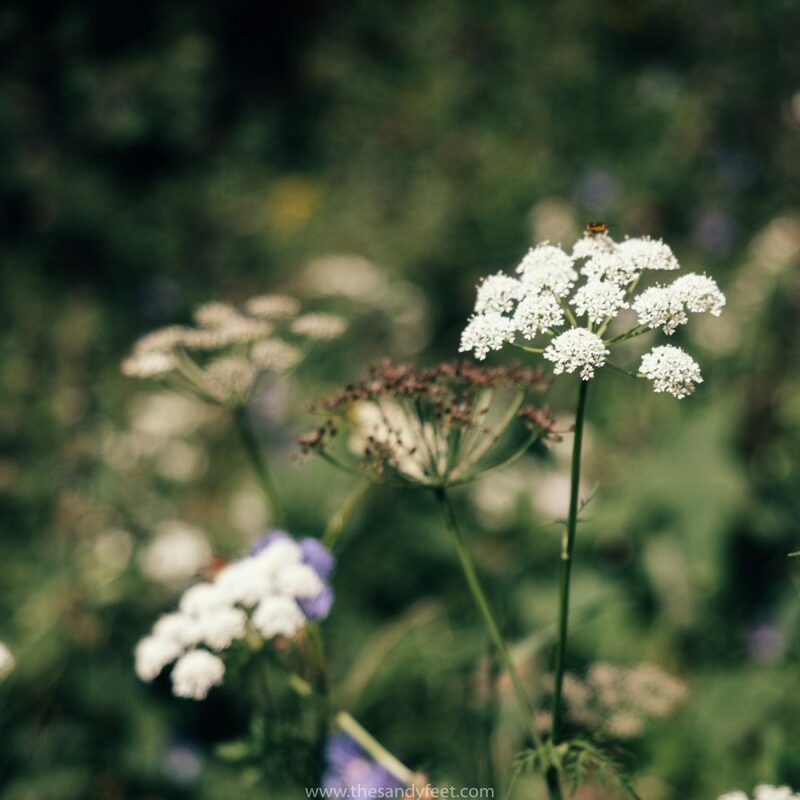 The lovely hike which takes you through alpine forests and countryside blanketed in wildflowers and berries is 8km long (one way) with some steep and very muddy sections. From the first lake take the trail which runs along the right side of the water and allow at least 6 hours for the return trip. On the banks of the second lake there is a picturesque camping area where you can stay overnight. 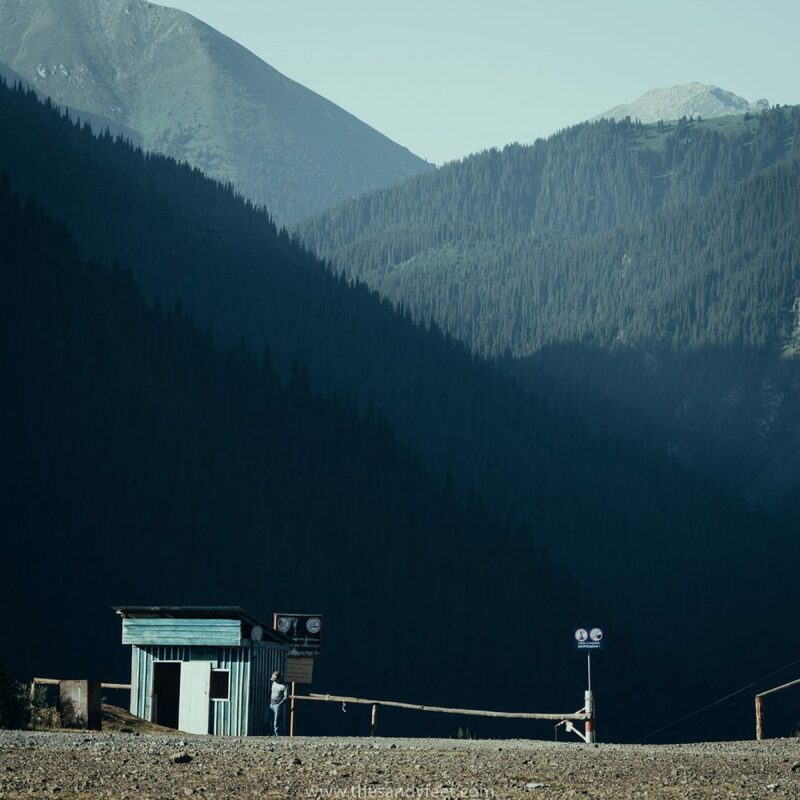 Due to its proximity to the Kyrgyz border, you’ll need a special permit to walk any further and guards do patrol this area. Bring snacks and plenty of water for your hike as well as wet weather gear as storms tend to accumulate here in the afternoons. Take A Boat Ride. 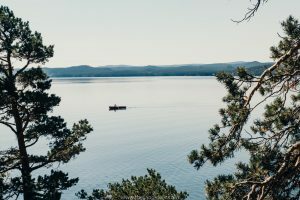 If hiking just isn’t your thing, you can just as easily enjoy the lake from its surface with a leisurely boat ride around the lake. Vendors rent boats by the hour from the lake’s edge. Drink Chai And Stay In A Yurt. One of the greatest pastimes in Central Asia (and one we can absolutely get on board with) is drinking chai, for hours. Our first afternoon we arrived too late to begin the hike and were feeling rather lazy after hours on the move so we simply curled up under the gazebo beside our yurt and drank tea while the sun sank down. This is also one of the few places in Kazakhstan where you can stay in traditional family-run yurts. Jibek Joly Guesthouse. Perched high on the hill overlooking the first lake, this guesthouse is perfectly situated to take advantage of the beautiful views. If you’re looking for a comfortable, if slightly pricey stay, this is your best option. Private rooms are available with the option of meals to be included. Yurts. Arriving at the lakes you’ll notice there are a number of yurts scattered along the green fields that surround the upper banks. Many of these are available for rent by visitors. Those on the hillside overlooking the lake charge around 10,000T ($31) per yurt while those set back above the parking lot ask around 5,000T ($15.50). All are basic with drop toilets (BYO toilet paper) and a single lightbulb. Meals and chai can be arranged on arrival though you are most likely limited to what they have available at the time. The mint green building on the edge of the hillside is another option serving up salads and the Kazakh staples of beshbarmak and manty. Camping. This seems to be the most popular choice among locals though there isn’t a great deal of space to set up your tent. 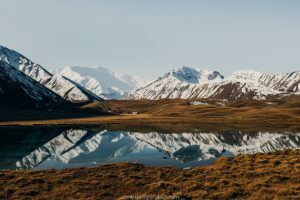 At the first lake, there are a few grassy areas on the hillside, or you can hike to the second lake and pitch your tent there or anywhere on route that offers enough space – there are some beautiful spots. As always, take your trash with you. Marshrutka: A marshrutka leaves from Almaty’s Sayakhat bus station for Saty at 6AM and, although we didn’t meet any other travellers who had managed to take it, we did speak to the driver who confirmed this bus does in fact exist. The confusion seems to be about where exactly in the station it leaves from. From Saty you’ll need to either hitchhike or take a taxi the final leg of the way. Be prepared to haggle hard for taxis and pay the entrance fee at the gate to the national park. 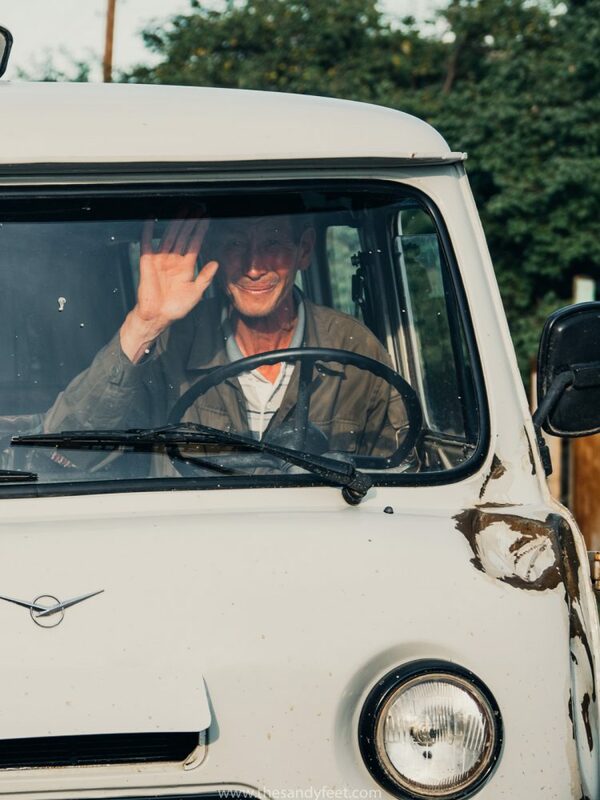 Marshrutka/Shared Taxi + Hitchhiking: If you can’t find the direct bus, take a marshrutka or shared taxi bound for Kegen and jump out at the turnoff to the Kolsai Lakes – early mornings is your best bet. From there it’s another 68km to Saty or 83km to the lakes which you will need to hitchhike or rely on a taxi coming past. Traffic along this stretch is fairly light but if they have space, most cars will agree to take you. As far as hitchhiking goes, we pretty much had a dream run along this stretch waiting just 10 minutes for our first ride which took us to the intersection between Algabas and Zhalanash, from where we jumped directly into another car that took us right to the lakes. All up the trip took less than 3 hours. If you also plan to visit the lakes directly from Charyn Canyon, you can read our complete guide here. 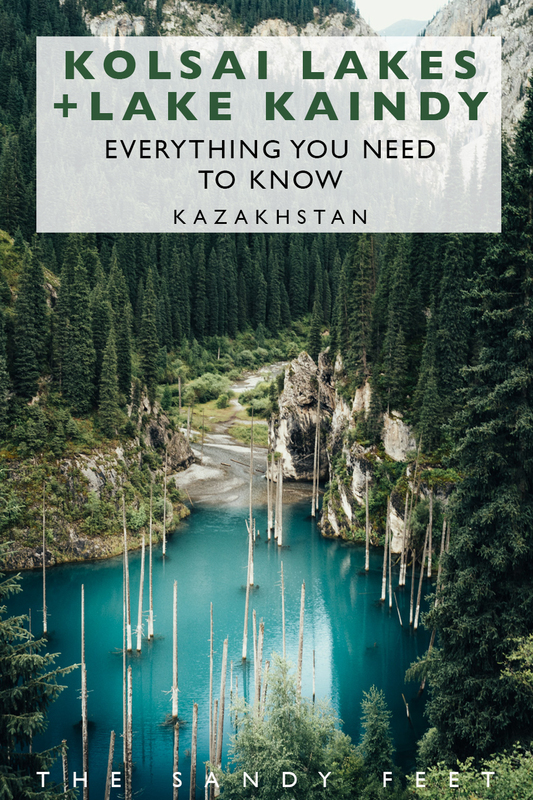 Organised Tour: Sure, it’s a fun part of the adventure figuring out how exactly to get to this remote corner of Kazakhstan, but if you’re short on time, visiting the area on a small group tour is also a great, hassle-free way to do it. This jam-packed 3-day itinerary takes you to Kolsai Lake, Lake Kaindy and Charyn Canyon and includes accommodation, transport, meals and all park entrance fees. 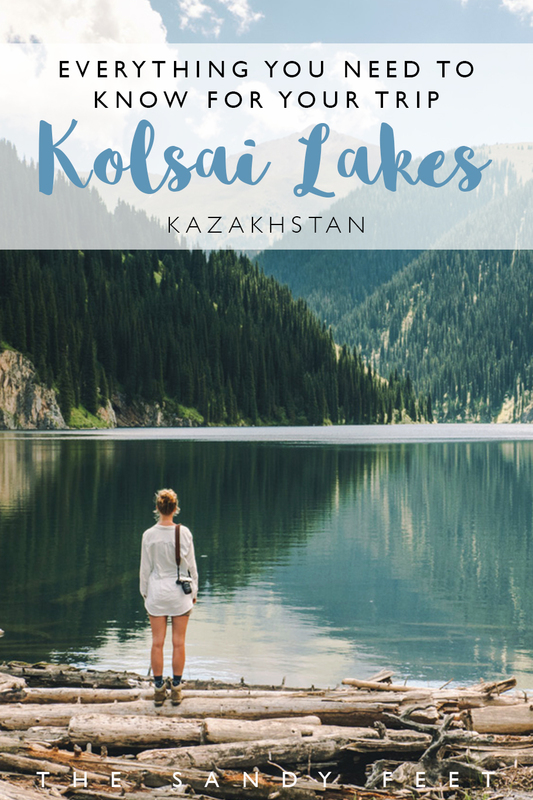 Check here for rates on Kolsai Lakes Tours. 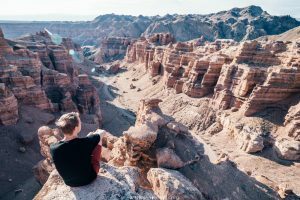 ESSENTIAL READING: Our Complete Guide To The Charyn Canyon! 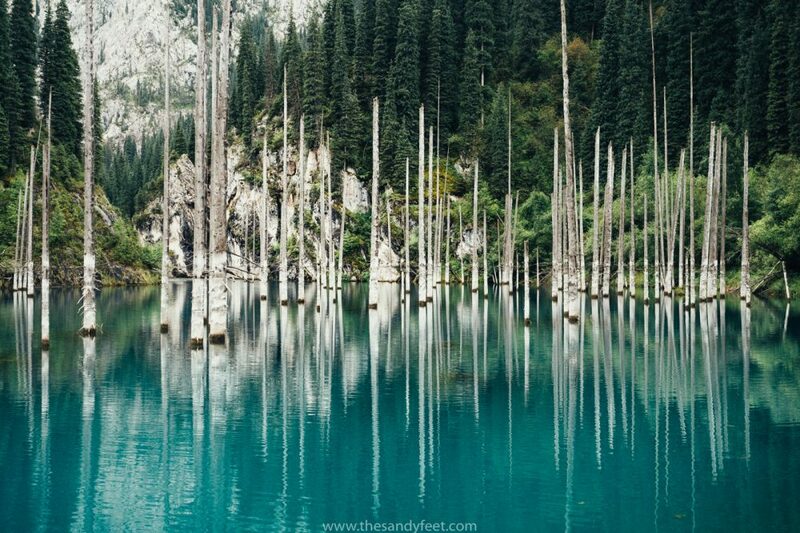 This ring of brilliant turquoise pierced by an eerie forest of stark white trunks is one of Kazakhstan’s most unique sights. From the lower parking area it’s a 2km walk uphill to the upper parking area (if you’re lucky you’ll be dropped here to begin with) from where you can reach the lake. 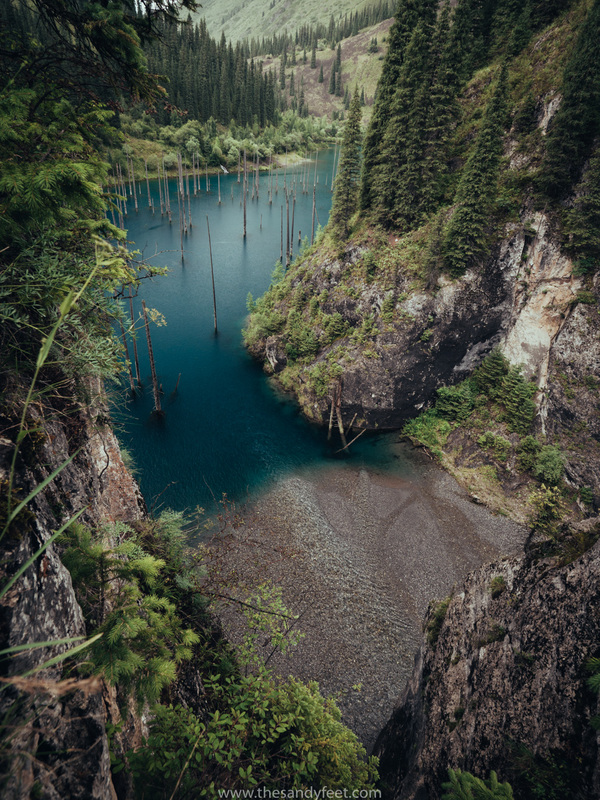 A dirt road runs along the upper banks of the lake offering spectacular views over the water and ashen trunks that stand frozen in its midst. To the left a smaller trail runs down to the water’s edge for a closer look at the trees, otherwise follow the road around to reach the opposite end. There’s a large open area here where you can camp overnight. There was no formal accommodation when we visited Kaindy but there is ample room to camp if you’ve got your own gear. 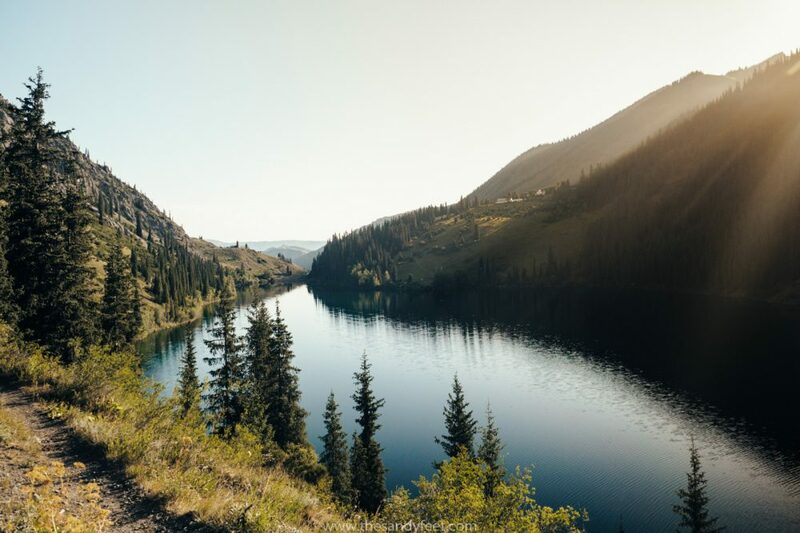 Follow the road that leads to the right around the lake and you’ll find a spacious camp site by the water. If you’re visiting for just a few hours, you’re better off staying in Saty. 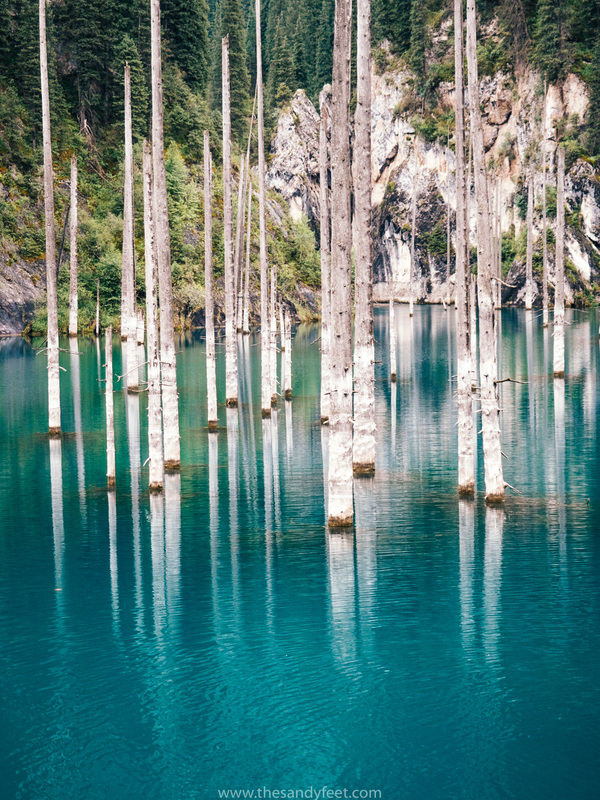 Spectacularly blue Lake Kaindy is just 12km from Saty and well-worth spending an afternoon exploring. If you’re equipped with a tent and feeling adventurous, you can hike and camp overnight at the lake. However, the far easier option is to take a 4WD taxi instead where you can explore for a few hours on your own before being driven back to town. Our very helpful homestay owner organised this for us and we shared the taxi with some local visitors who were staying next door. 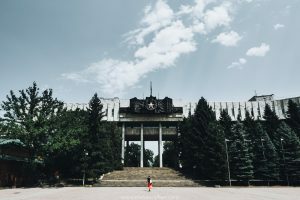 DON’T MISS: The Very Best Things To Do In Almaty! Though a perfectly lovely rural village in Kazakhstan, Saty is more useful as a base for exploring the surrounding lakes. There are a number of guesthouses and homestays in Saty with signs saying as much out front. But, after stumbling into the first shop we reached in town, we were directed to a homestay a few streets away with lovely hosts that took excellent care of us. If you’re feeling stuck, just ask around town and someone will be able to point you in the right direction. 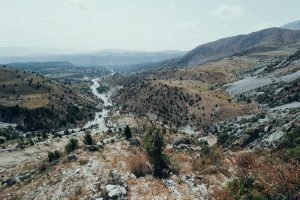 We paid 7,000T ($21.80) for one night at the homestay including all meals and plenty of help in organising our taxi to Kaindy and the marshrutka back to Almaty. We found the locals here spoke virtually no English though so if your Russian isn’t up to much like ours, we’d recommend bringing some kind of translation app to help with organising your onward travel. 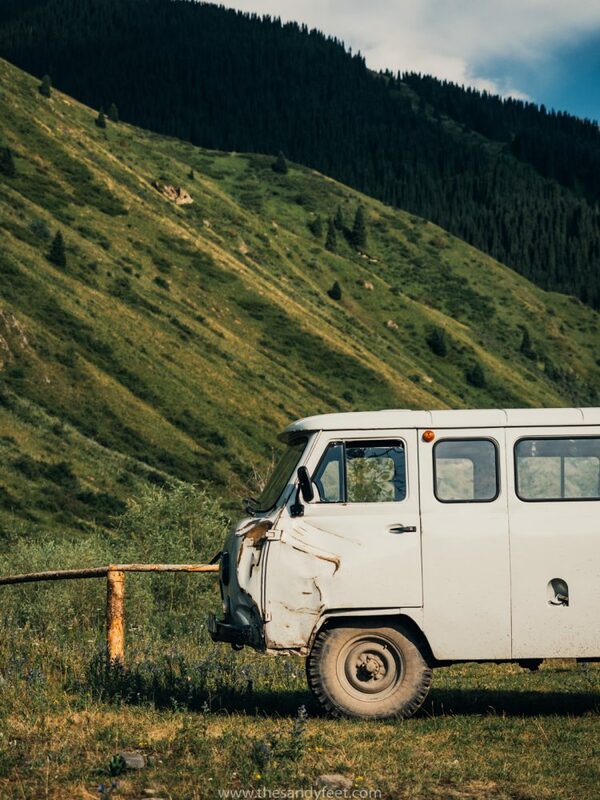 Getting from Saty back to Almaty is entirely more simple than getting there and involves just one marshrutka that picks you up from your door. The bus leaves at 5AM and drops you back at Sayakhat bus station in Almaty. Be sure to ask your guesthouse owner to organise this service for you as the driver travels from door to door picking people up – there is no general bus stop in Saty. Don’t bring all your stuff. 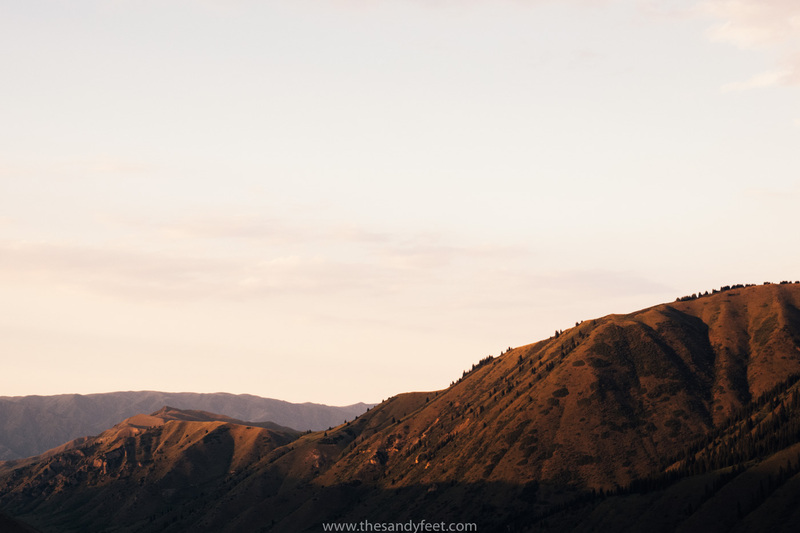 If, like us, you’ve packed way too much stuff and are planning to return to Almaty, there’s no need to lug your heavy backpack halfway across the country. 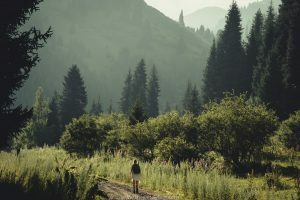 Not only are big bags annoyingly cumbersome for hitchhiking, if you do need to walk between destinations, you’ll quickly regret arriving with so much stuff. If you’ve brought a manageable pack, great. If not, bring just the essentials! There are no ATMs. 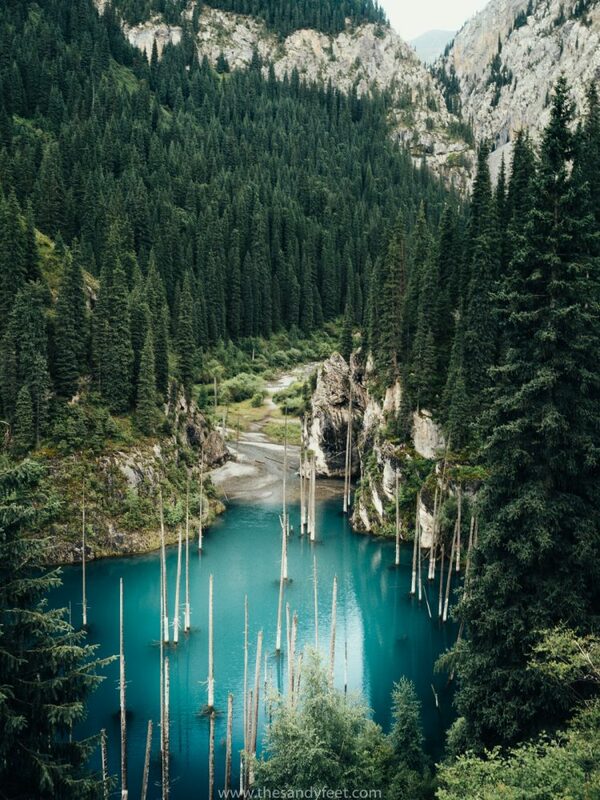 There are no ATMs anywhere near Kolsai Lakes (or Charyn Canyon) so if you’re doing this as a longer trip, you could very well be out here for a full week. 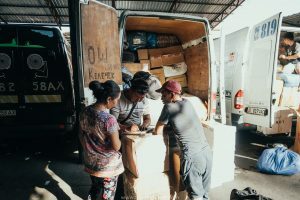 Bring more money than you think you might need, in case you’re asked to pay for your hitchhiking trips, get ripped off by a taxi driver or become stuck here a little longer than initially planned. Purify your water. All the water we were given to drink here came straight from the lake and although we were assured it was perfectly safe to drink, the number of horses we saw walking beside the water and relieving themselves made us a little less confident. We’d highly recommend bringing some kind of water purification system for your trip. Our go-to is a stainless steel Klean Kanteen water bottle and a SteriPen. Be prepared for all weather. 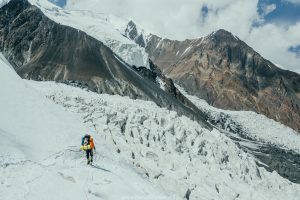 It may be sweltering in Almaty but out here in the mountains, it’s another story entirely so bring warm clothes and wet weather gear, just in case. You can cross into Kyrgyzstan. 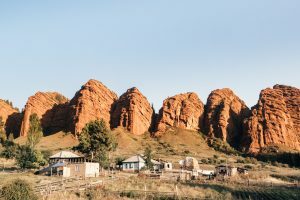 If you’re travelling in the summer months and Kyrgyzstan is on your agenda, you can cross the border near Kegen and travel onward to Issyk-Kul rather than returning to Almaty and moving on to Bishkek. This relaxed and little-used border crossing in the Karakara Valley is not the most straightforward requiring a combination of marshrutka and shared taxis, but it’s certainly doable. We didn’t do this route but you’ll find some detailed instructions in this guide. Get Appy. English is not widely spoken in these parts and even with our top-notch charade skills, communication was rather difficult. 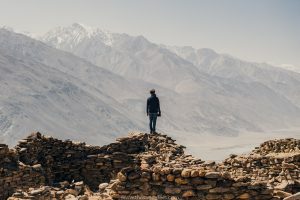 We’d recommend bringing some kind of offline translation App on your phone, just in case, and an offline map of the region to help with navigation. We used Prompt Translator and Maps.Me. Short on time but don’t want to miss this beautiful part of Kazakhstan? 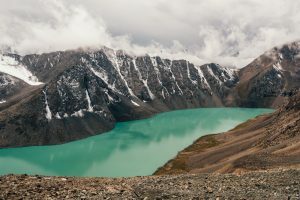 You can also visit the Kolsai Lakes, Lake Kaindy and Charyn Canyon as part of a jam-packed 3-day tour. Heading back to Almaty? Don’t miss our guide on all the best things to do in the city or search for accommodation for your return journey! 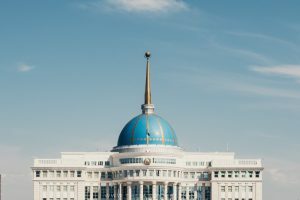 Loved reading this and I can’t believe how beautiful Kazakhstan is! Lake Kaindy in particular looks incredible. I’m going to plan to visit either this year or next! Great post and beautiful photos. This is definitely not how I imagined Kazakhstan! Neither did we! It felt like we had wandered into somewhere like Switzerland. 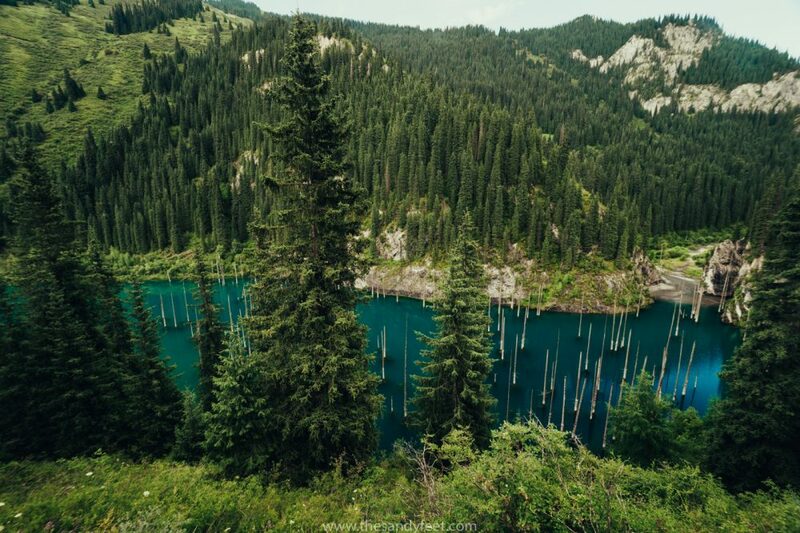 We were just there last week and yes Kolsay Lakes national park was super pretty, as was the rest of the national parks and reserves in the Almaty region. By the way, when you say the homestay in Saty was 7000 tenge , is this for 2 persons or 1? We paid 14000 for the 2 of us (all meals included) per night although we did have western style toilets and hot showers, which is apparently rare in Saty. Hey. Is there any chance to hike from Kaindy lake to Kolsai lake? Is there somemhiking trail? Thanks in advance. Hey Matej, As far as I know and can see on the map, there isn’t a specific trail between the two, but if you really wanted to hike you could always follow the road. Between Kaindy and Saty it’s a rough dirt track without much traffic so could be quite pleasant, while the road toward Kolsai is due to be paved so is probably not as nice for hiking. Have a great trip! Wow reading this article brings me back to Kazakhstan 3 years ago! 🙁 I miss the horse meat!!! It’s such a beautiful spot hey, but I think you’re on your own there with the horse meat. Definitely not to my taste!